2 Bedroom Detached Bungalow For Sale in . for Asking Price £250,000. 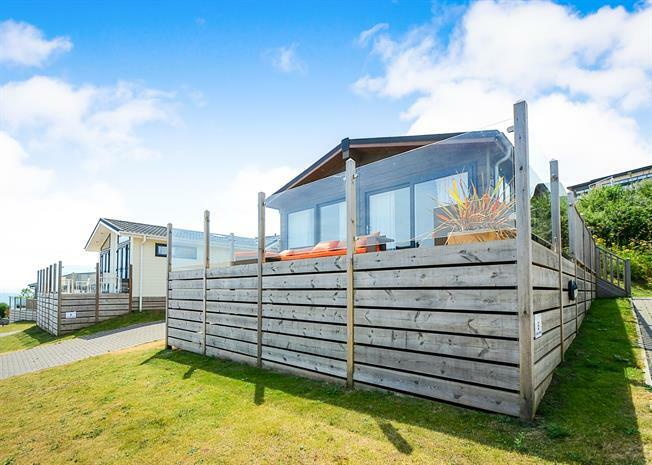 Tranquillity and contemporary living is offered at this luxury holiday lodge which is situated on the Coast View development accessed via a gated entrance. The accommodation offers a spacious lounge/dining room with sliding doors leading to the decked area with views across to the Devon coast, modern fitted kitchen with integrated appliances, modern bathroom with en suite to the master bedroom. The Retreat is being offered for sale to include the modern fixtures and furnishings and site fees have been paid up until Jan 2019. Smoke alarm, inset led lighting, radiator door to airing cupboard housing combination boiler and shelving, doors leading to various rooms. Vaulted ceiling with inset led lighting, rustic cedar cladding to one wall, double glazed window to side, range of modern cream wall and base units with wood worktops over, inset four ring gas oven and hob, concealed extractor hood above, part tiled surround, inset stainless steel sink with drainer, mixer tap, integrated dishwasher and fridge/freezer, vinyl flooring. Double glazed windows to both sides, vaulted ceiling with inset led lighting, TV aerial point, two sets of double glazed sliding patio doors leading to weatherproofed millboard decking area with glass viewing panels offering views of the Devon coastline. Extractor fan, led lighting, modern suite comprising low level WC, dark wood wash stand with inset square vessel basin, mixer tap, one and a half length shower cubicle with sliding shower screen, part tiled surround, wall mounted ladder style radiator, vinyl flooring. Double glazed window to side, vaulted ceiling with inset led lighting, radiator, TV aerial point. Velux window, inset led lighting, extractor fan, modern three piece suite comprising low level WC, walnut wood wash stand with square vessel basin, mixer tap, panelled bath with shower over, wall mounted ladder radiator, vinyl flooring. Large block paving double parking space, landscaped garden surrounds the weatherproof millboard decking area which has glass viewing panels offering views across the Devon coastline, outside lighting.